50 years of places of longing, made by Rolf Benz. Almost a hundred years ago painter and photographer Heinrich Zille pronounced that “it’s as easy to kill a person with a home as with an axe”. Since 1964, the German firm Rolf Benz has been doing its bit to reduce death by bad home furnishing. 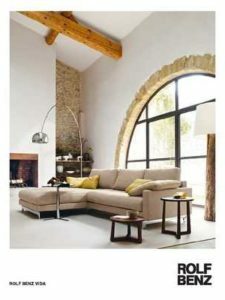 Because Rolf Benz has been producing sofas for exactly 50 years. Some say they are the most desirable sofas made since humans discovered the sheer physical pleasure of sitting back and relaxing but not quite lying down. They may have conquered the world, but these highly prized zones of relaxation originate from a tiny, peaceful spot on the edge of the Black Forest by the name of Nagold. Here, fifty years ago, a young designer realized that while everything relating to furnishing may impact temporarily on our reason, it remains permanently embedded in our emotions. 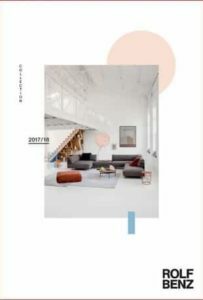 This is why with every individual sofa, the familiarity and popularity of the Rolf Benz brand – now a household name in over fifty countries – is helping create that uniquely personal spot we spend a lifetime longing for. The spot in which we feel we have finally come home. The young upholsterer, Rolf Benz from Nagold in the Black Forest, recognises right away the sign of the times. Inspired by this spiritual awakening, he founds “Rolf Benz” in 1964. The first sofa and armchair programme from this young company remains true to this new, modern sense of space: the addiform from Rolf Benz. It makes a radical break from the traditional, conventional arrange­ ment of sofa, two opposite­facing armchairs and a coffee table. The elements of the addiform are flexible and combinable in their arrangement. Thus, you can­ not create a typical seating arrangement with these sofas and armchairs, but rather you can create imaginative combinations of “furnishing landscapes” as people were fond of saying at the time. In fact: you can “add” an addiform arm­ chair or even place it over a corner. 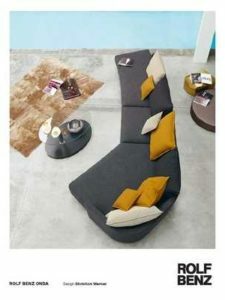 You can position an armchair either as an individual armchair or combine it with a coffee table as an intermediate element; or connect an armchair to a bench and finish it off with a corner coffee table on the side, the list goes on and on … Yes, and the sofa itself can be folded out into an additional, comfortable place to sleep. the addiform: simple, subdued, functional, as well as beautiful and practical at the same time. those who look at it – 50 years later – are amazed at how modern, how timeless the addiform is, and how consistently Rolf Benz was able to seize upon the spirit of the times. 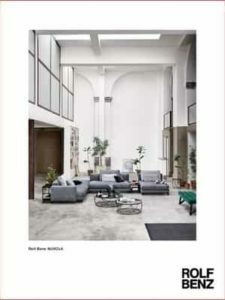 The following has been true at Rolf Benz for 50 years: the furniture with which one lives should be as flexible and versatile as the person himself. The seventies started on a soft and transparent note. It was the age of the bean­ bag. In 1971, a well­known namesake registered its development of an airbag as a German patent in Stuttgart­Untertürkheim, and 1971 was also the first time that Rolf Benz took its own dedicated booth at the Cologne trade Fair. 1973 saw the opening of the World trade Center in New York, and a patent for the automatic cash machine was registered in Germany. This was the decade in which men liked to sport pink polo shirts with the col­ lars turned up and Bommel shoes. As ever, the fashion message permeated the world of furnishing too. That message coming over loud and clear in the eighties was: “We’ve made it”. Diana married Charles; Roland Reagan was in­augurated as the US President; Gorbachev was made “Man of the Year 1985”; we lapped up the forged hitler Diaries in the Stern magazine; the Chernobyl disaster struck; Zündapp went into liquidation (clearly not glamorous or chic enough) and, at the end of the decade, the wall came down. These were years in which the stuff of dreams was brought to us in pictures. 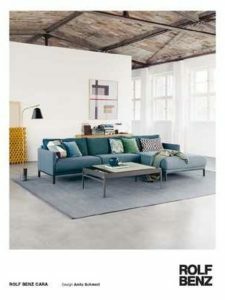 As if that were not enough, a Rolf Benz sofa had the star quality for the biggest TV show of all. For years, the family game show “Wetten, dass…?” held the big Saturday evening spot across Germany, Austria, Switzerland and the Benelux countries. This mega family entertainment show hosted by thomas Gottschalk, saw the celebrity elite of the day getting comfortable on Germa­ny’s most famous sofa – a bespoke creation by Rolf Benz. It was followed by the models VERO, PLURA and MIO, true ambassadors for nonchalant luxury over the excessive trappings of status. 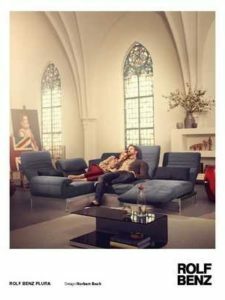 With the advent of a new era of cool lounges and relaxation zones for the discerning, in 2003 the company launched its EGO as the ultimate “made­to­measure sofa”. Today, VIDA or ONDA still subscribe to the ethos of these highly complex modular ranges. Ranges that allow the creative customer the greatest possible scope for individualization, with the freedom to configure and adjust the different modules to any specific living situation. The computer industry with its ever more slender flat screens is not alone in creating a quiet revolution: clarity of forms and slender contours are transfor­ ming the furniture sector too. And yes, just as it did in 1964 with the “addiform”, once again Rolf Benz gives us the gift of endless possibilities in its own inimi­ table and elegant style. Its sofa ranges are designed to give every individual the freedom to think around corners, to line up in rows, to adjust and adapt, even to create our own ergonomy. Spearheading furnishing trends today are individually changeable, multifunctional sofas with adjustable seat heights and depths. Infinitely variable headrests, variably mountable and adjustable backrest and side cushions, depth adaptation – all these features invite us to find our very own favourite position for relaxation. The Rolf Benz sofa has become the ultimate made­to­measure suit for our homes. 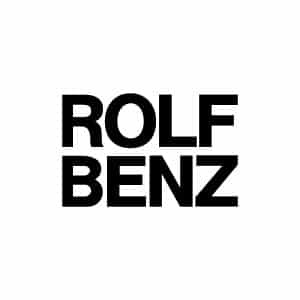 Behind the somewhat innocuous term “system furnishing range” is in reality nothing other than the core competence which has distinguished the Rolf Benz brand for 50 years. Today we are seeing the merger of classical living areas into open­ended living spaces: we spend time reading books or magazines in the bathroom, we watch TV in the kitchen, and sleeping, working, living are no longer cordoned off in their own separate spheres. 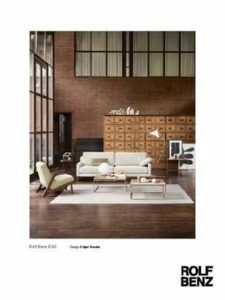 Because for the past 50 years, furniture, sofas and chairs from Rolf Benz have been designed and produced for living spaces, not for living rooms or lounges. NEED MORE ROLF BENZ INFORMATION ?